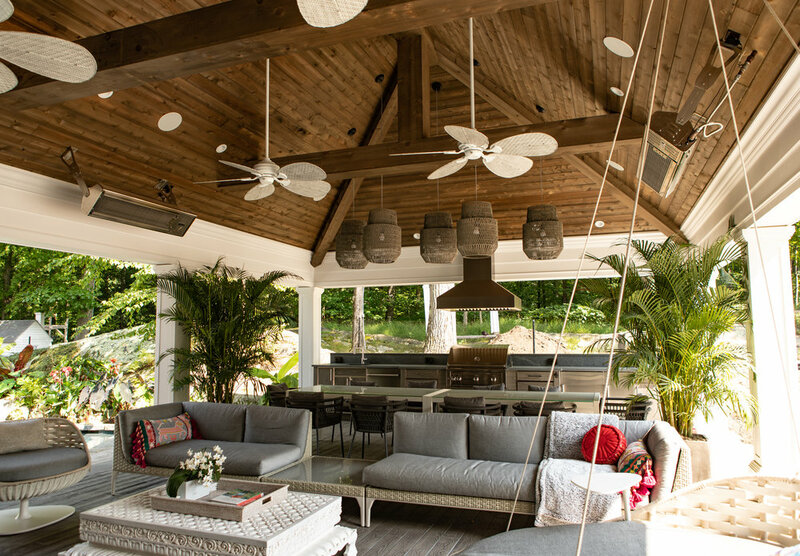 This pool house/cabana doubles as a tennis pavilion. For this project, the client wanted to create the feel of Bali in their backyard. The homeowner created a custom stain for the Western Red Cedar out of vinegar and steel wool. The synthetic pavers used on the floor are stamped with a woodgrain to provide a natural look and are ideal for outdoor spaces because they are weather resistant. The same flooring was used around the pool terrace to visually connect the two areas. 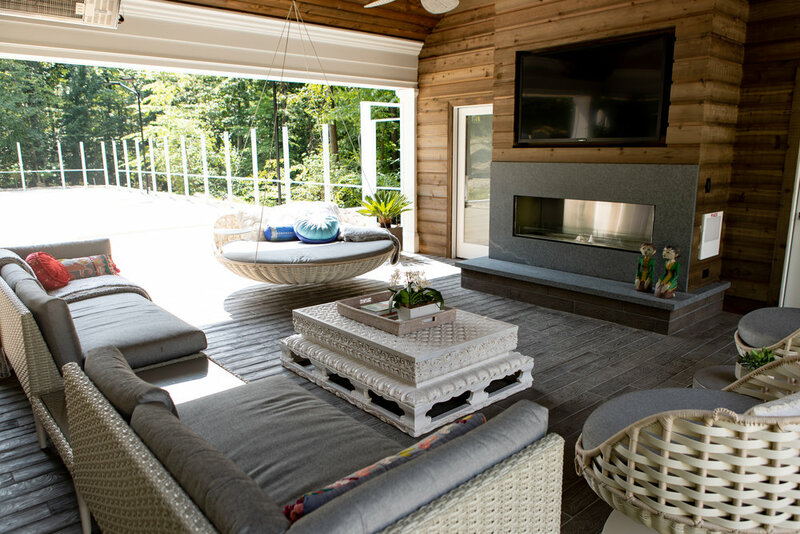 The open design of this pool house makes you feel like you are outdoors, yet it provides all the comforts of being in your home. A niche was cut out of the wall of the fireplace to seamlessly integrate the TV into the living space. The full outdoor kitchen with custom hood and the large dining table allows for easy entertaining. This home took on a complete renovation, inside-out. 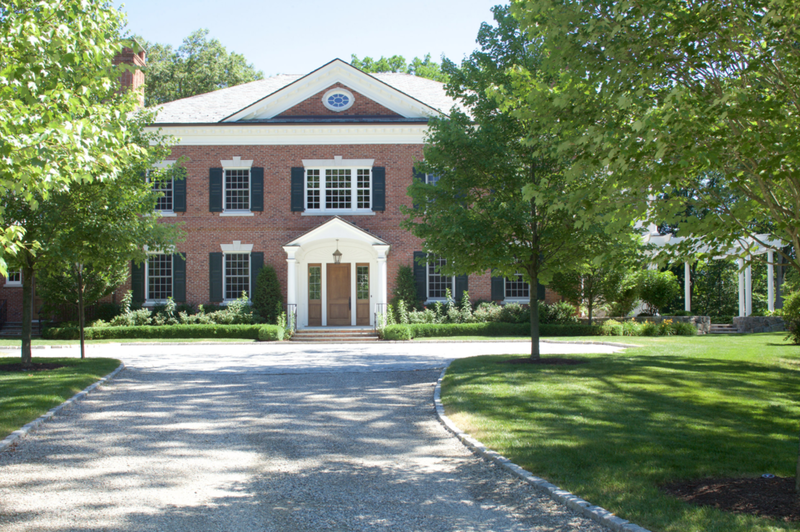 Adding a second floor to the main house, the homeowners drastically increased their interior livable space. 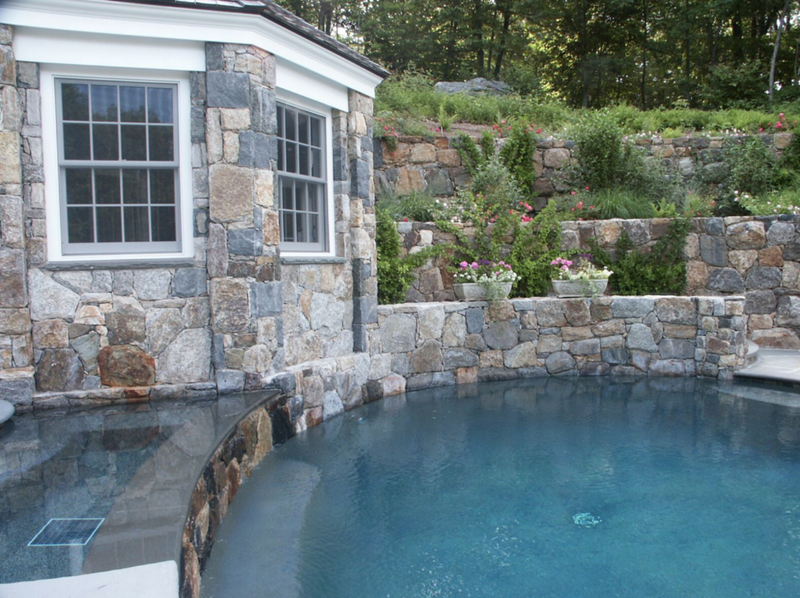 For the exteriors, the swimming pool was complemented with a new pool house with a wide, inviting entrance. 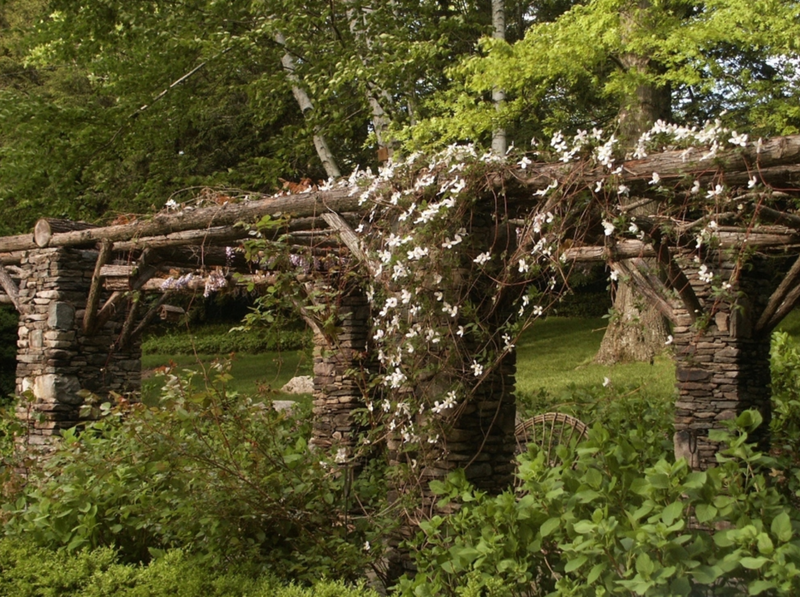 To balance the shingle style with country rustic, the new pergola was made from fallen branches around the property. This Georgian-inspired landscape features outdoor living rooms that are complete with natural stone, gazebos, and pergolas. Each space provokes reflection, conversation, and warmth. All of the transitions (including the granite block courtyard, flagstone brick and granite terracing, and natural stone walkways) that connect the spaces are as precisely built as each destination, leaving no small detail behind. 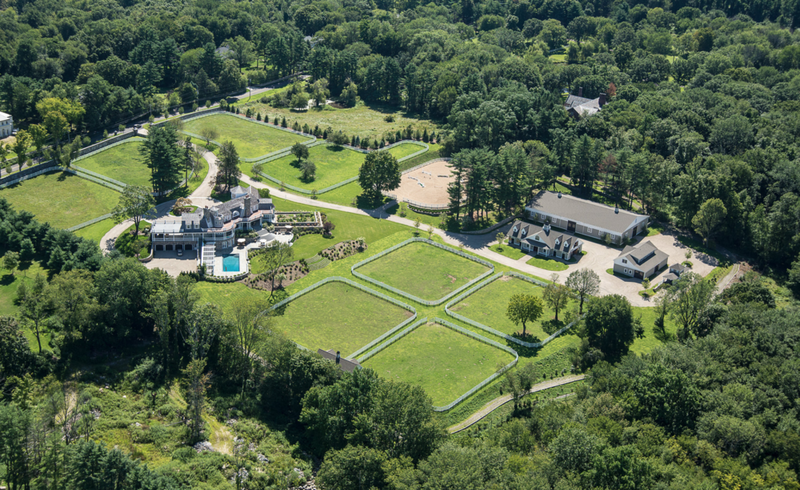 Containing several garden rooms, this estate provides these homeowners the perfect combination of landscape spaces. Intentionally placed near the outdoor dining area, the vegetable garden in raised beds offer fresh herbs, vegetables, and fruits. Escaping into a mindful walk that starts with natural stone steps, an English-inspired garden evokes all the senses with bright-colored tulips in the spring, lavender plantings, and a water fountain as the focal point. Other gardens include a wetland wildlife, succulent, butterfly, and all blue. All this with a 100% toxic chemical-free, organic approach. Just as your mind has found rest, the final path leads to a naturalistic poolside retreat. Working with the designers at Conte & Conte, the Fairfield House & Garden team built more livable space indoors and outdoors for this family. For the indoors, a two car garage that perfectly complements the main home comes with a complete second floor apartment that can be used an office, in-law suite, or guest house. 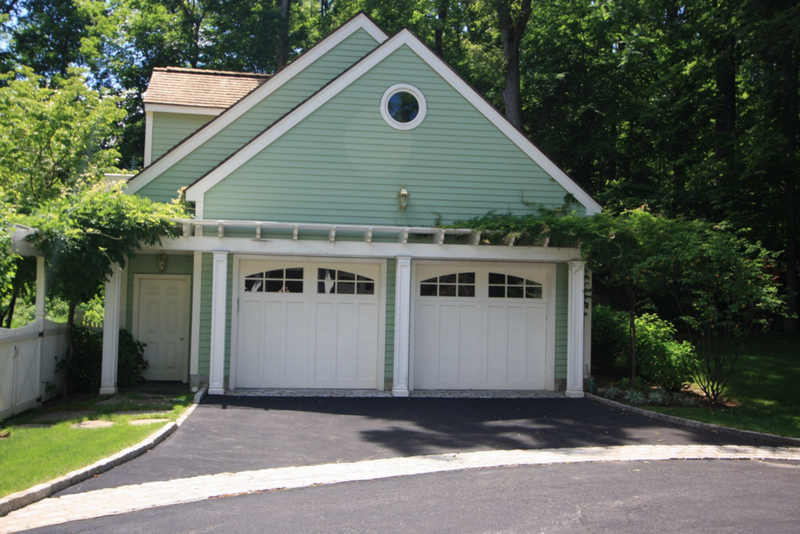 The attached pergola (with plantings) on the garage provides aesthetics and function with shade while the garage apron creates an inviting entrance. The path to the garden starts with a meticulously built fence around the perimeter and an entry through the arbor covered with roses. These pops of color continue throughout the outdoor areas with pink flowers, lavender, and more roses over a second pergola near the patio. At the pool, find retreat at the outdoor dining areas or in the gazebo. The skilled team at Fairfield House & Garden completed the landscape construction work for this project including the raised patio located off the back doors and the installation of lush planting beds bringing the property together. 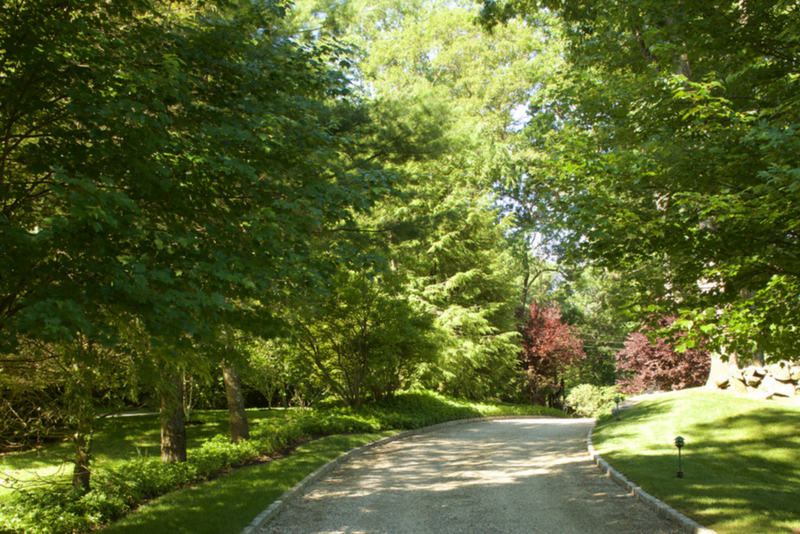 The FH&G team also maintains the property's landscaping. 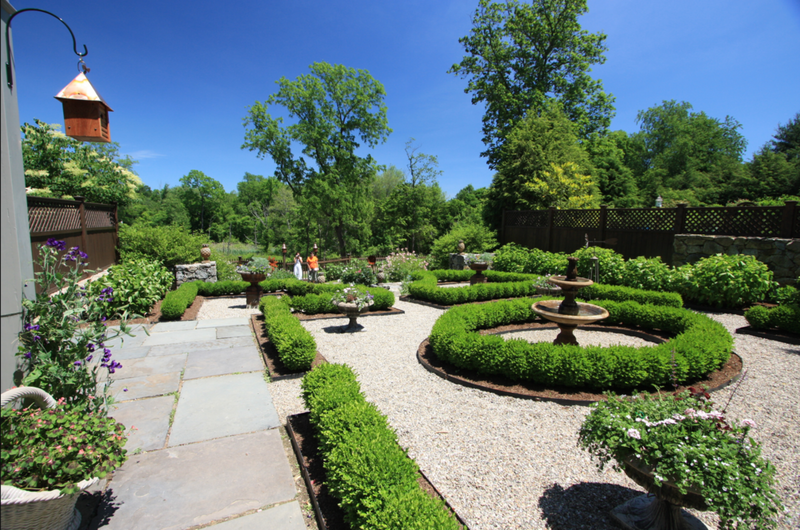 Set on a steep hill, this natural beauty was built by the Fairfield House & Garden team to blend in the surroundings. 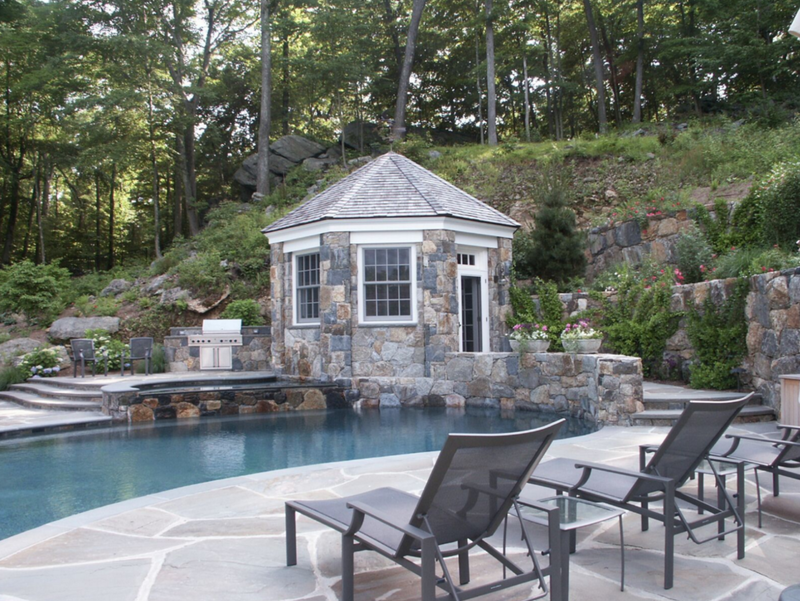 Using natural stone throughout the pool patio spaces and the pool house, it's hard to feel like this beautiful modern-rustic outdoor retreat hasn't been here for hundreds of years (but of course, in perfect condition!). 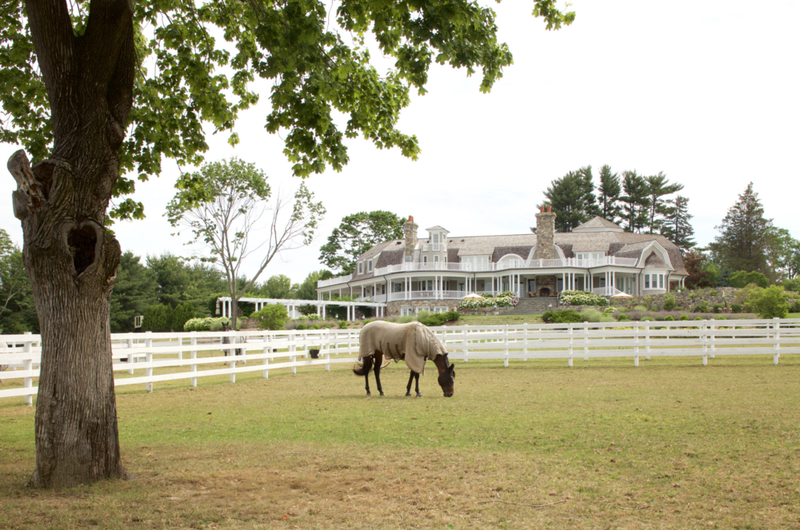 This elegant horse farm features sod steps, a vegetable garden, and planting beds. 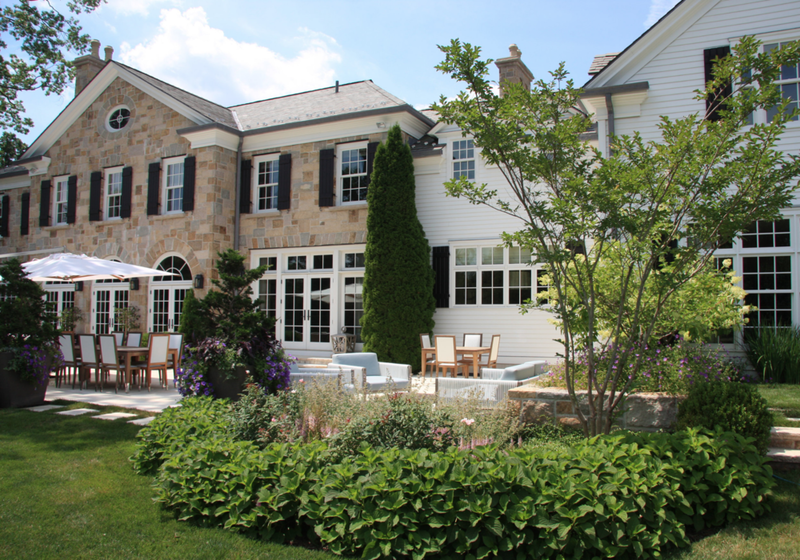 Naturalistic plantings like hydrangeas and grasses help provide a country classic style. 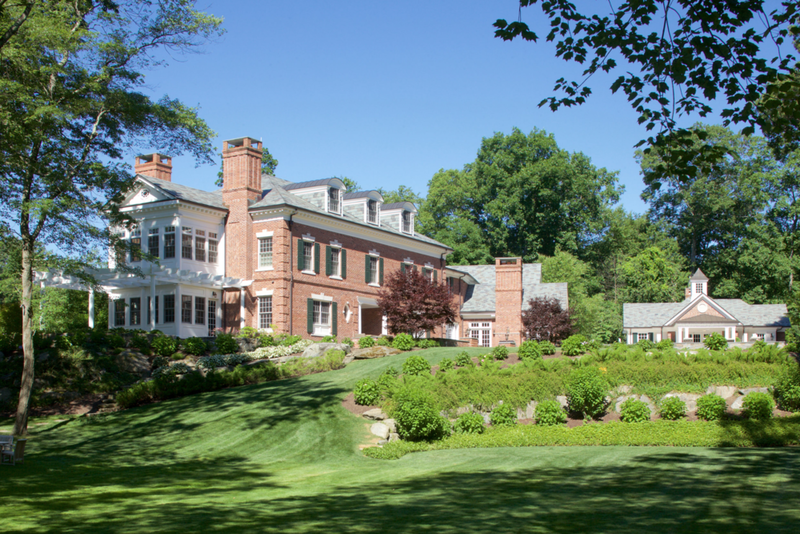 The Fairfield House & Garden team completed all of the landscape construction and all of the home's and site's masonry in the front and back of the home over an 18 month period.